Is your dishwasher’s tray not working? Is it not gliding in and out smoothly? It could possibly be because of a broken or damaged wheel support. Buy the replacement Dishwasher Basket Wheel Support and get that professional dishwasher cleaning all over again! 100% genuine and quality-tested, the Zanussi Dishwasher Basket Wheel Support is suitable for Zanussi dishwashers as well as dishwashers from other brands like Electrolux, AEG, Bendix and Tricity. Fits AEG, Electrolux, Tricity Bendix, and Zanussi Dishwashers - also see the Dishwasher Wheels below that relate to this part. Upper Dishwasher Basket Wheels - 8 in a pack. 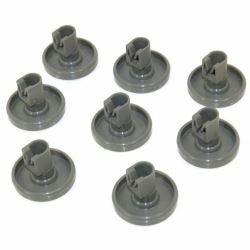 This genuine set of 8 genuine lower basket wheels are made from high-quality plastic material and are designed to fit select models of Electrolux dishwasher. Great upper basket wheels to replace the very worn parts in our dishwasher. These had resulted in the whole basket keeping becoming detached. Our dw which, although 21 years old, still gives very good service so we are reluctant to replace it and ransome spares was the only site offering compatible parts. With the new wheels in place the whole machine works like a dream again. Thanks for the prompt delivery! Only difficulty we had was, having watched the instructional video, we found we could not remove the sides of our dw as they were welded on. My husband then had to invent his own method of attaching the part- took some manoeuvring but managed it in the end hence only 3 stars for ease of fitting. He will however know how for future reference. Highly recommended. The order for Basket Wheel Support was fine and the part fitted well. Did a great job on our old dishwasher. The upper basket slides much more smoothly now. The wheels were easy to fit - two screws for each one, and no problems. These wheels fit on the inside walls of the dishwasher; we also replaced the wheels and adjustment mechanism on the basket - see separate review. arrived the next day, fittred easily. Operates properly. These were replacements in a 20 year old dishwasher. Only problem was removing the screws, but it was worth the bother. At our ages 70 ++++ we will hopefully never need to repeat the operation!! I now feel that by replacing the part that I have a new dishwasher, no plates falling off the basket!! 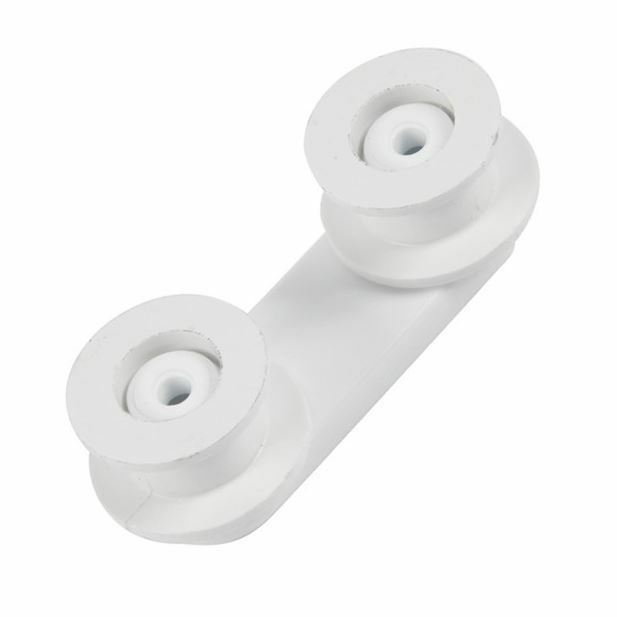 Straight replacement for the original wheel support on our Zanussi dishwasher, so did the job to stop the runners from continually falling off when pulling the basket out. Good cheap repair option and relatively easy to fit - BUT BEWARE - the part that the screws go into is loose behind the inner casing and whilst it may not drop down altogether, it can easily slip away from the holes. To avoid this, remove just ONE screw, and very slightly loosen the other, so you can swivel the old part and retain the rear fixing in place while you replace the screw in the new fitting, then repeat with the other screw.